The iPhone unveiling in late 2017 was epic. Perhaps the most impressive part of this type of Apple announcement is the degree which live technology demos are used on stage – typically in front of millions of people. Because it is such an impressive way to show a new product and innovate for impact is why Steve Jobs loved this – even though it frequently caused much anxiety by others at Apple. This anxiety reflects the challenge of introducing product in real time which has not been proven for commercial use. This is both a very exhilarating and palpitating experience. While Jobs did this flawlessly at the 2007 iPhone introduction, it’s reported that every time a part of the demo went well the Apple techies and engineers backstage would take a swig of whiskey to celebrate ! Extending on Jobs mastering of innovation, product design, marketing, and delivering a great User Experience, doing impressive presentations inspired people to believe in the company and what was possible. This is a great example that nothing inspires like confidence. So, it’s little surprise that Apple once again took on that risk with the recent iPhone X announcement. 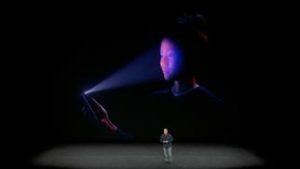 As usual, the presentation was going very well until it came time to show the single most powerful new feature of the iPhone X – Face Recognition – to unlock the iPhone. When Craig Federighi, the Apple Sr VP of Software Engineering was preparing to show how fast and smooth face recognition was to activate the phone, it immediately brought up the familiar manual code entry screen ! Suffice to say, it wasn’t a good time to get an unexpected result ! That’s when things could have gone very wrong. But they were prepared, and what followed was classic Apple and for all those who recognize ” The show must go on. “. It’s also a lesson for anyone doing live demos that without showing alarm or missing a beat, Federighi picked up the backup phone and used the face recognition without a hitch. To view the incident, see the above video. Not only did the smooth transition avoid a potentially very embarrassing situation, it showed great confidence in the product to do what was intended. This contrasts to many presenters who react when something goes wrong by getting flustered, commenting on it, making apologies, etc. This undermines credibility as well as a loss of momentum and enthusiasm for an innovative new product or service. But Federighi did none of that, he just kept on going – which is not an easy thing to do. After the announcement, social media was very active about the issue. Apple responded quickly explaining why the primary phone did what it did. Because the demo iPhone during set up was being used by others to unlock the phone – it didn’t recognize Federighi’s face ! So, the phone did exactly what it was supposed to do ! After an attempt to unlock it using a different face, a passcode is required. As a result, not only does the face recognition work as demonstrated with the backup phone, but the primary phone showed the process when the person not authorized tries to use the phone. As anyone sensitive to personal privacy and system security realizes, this validates iPhone X face recognition works and can contribute to the safe use of technology. No matter what, keep going knowing the audience will react as you do – especially if you project anxiety, awkward humor, befuddlement, etc. While Federighi was prepared but unable to explain the situation, he quickly said “ let’s go to the backup ” – to continue with the demo. He didn’t appear flustered or challenged in the moment. The message was, if it doesn’t both me then it shouldn’t bother you (as opposed to if I’m sweating bullets then you should be worried). To create and maximize opportunities from innovation, have a backup with option B, C, etc. In this case while the backup phone performed as expected, there was probably another backup nearby, an autoplay demo, etc. If you want to plan for success make sure you also plan for surprises ! After the event, Apple was responsive and transparent in joining the conversation. They reviewed the phone’s logs and found out exactly what had gone wrong and promptly advised people what happened. This is a great example that setting and achieving impressive goals, transparency, accountability, etc. build trust and inspire confidence. The lesson learned from all of this ? Epic doesn’t just happen – You have to be prepared, committed, and ready to deal with surprises.